Click on an event to open/close detailed information. * = closed event, on invitation only. Our panel intends to provide participants with an enhanced understanding of the challenges to using Earth observation data and data products from a humanitarian response and development perspective. The session will be broken out into two scenarios. The first scenario will represent the identification of data needed and decisions made in a rapid-paced environment to impact on life and property. This will capture the process of deciding what data is needed, who is at risk (vulnerable and exposed), and what elements of risk need to be communicated to ensure informed decision making, as well as exploring modalities of communication. The second scenario will represent the need for data to enable decisions following a disaster response, with the goal of informing future resilient development as well as whether people are placed in a more risk-exposed or risk-adverse environment. The second scenario will include decisions regarding relocation and how to identify settlement development that avoids unintended risks and related consequences. The session will conclude with a formal panel discussion that walks the participants through the various roles that governance and policy (Sendai Framework), remote sensing and Artificial Intelligence, and cognitive science have to play in these short- and long-term scenarios. The third GEO Data Providers workshop recommended to bring more knowledge into GEOSS. This is confirmed by the analysis of GEOSS use and data contents performed by the GEOSS EVOLVE initiative. This event will present the current analysis, discuss the evolution challenges and scenarios of GEOSS, and present the advancements planned by the GEOSS Platform team to address current needs and move from data to knowledge. In particular, the GEOSS Platform team will present the next coming functionalities to support knowledge sharing in GEOSS, discussing with the Community (through dynamic and interactive sessions) the fundamental transformation towards a Knowledge-based Platform. NextGEOSS is a European data hub and platform, supporting the setup of results-oriented Earth Observation based services. Learn how NextGEOSS is integrating more than ten pilot applications and services for systematic processing in a scalable cloud environment. The integrated applications span through diverse areas of major interest for GEO such as Crop Monitoring, Energy Operations, Biodiversity, Air Pollution and others. In this session a method for co-designing with partners through streamlining a five-step process of Engagement, Data Preparation, Platform Setup, Pilots Integration and Service Operations will be explained. The presenters and audience are invited to discuss how this can be aligned with and contribute to the future GEO. 10:00 Discussion: How would you leverage your service through GEO using NextGEOSS? The objective of the event was to present H2020 projects (e.g. AfriCultuRes, TWIGA, SWOS, GEOCRADLE, GROUNDTRUTH 2.0) promoting the uptake of EO data in Africa in order to enhance food security, water supply, protection of biodiversity, diversification of the energy resources, and building of a climate resilient society. The event explored reinforcing the participation of those projects in the GEO's multiannual Work Programme in coordination with the initiative GMES in Africa. Capacity Building or Development, is a cross-cutting aspect of all GEO activities, whether a flagship, thematic or regional initiative, or community activity. Different CB intervention modalities are being used at individual, organizational or institutional level or at a combination of levels. CB targets different audiences and uses varying levels of impact monitoring linked to quantitative and/or qualitative indicators and through sharing success stories. This session will highlight ongoing CB activities in GEO and provide an open forum for discussion on effective practices and needs that can be incorporated into future workplans. Points of contact and CB coordinators of GEO flagships, initiatives and community activities. Project members involved in CB activities or in developing CB resources. Collaboration with existing and new GEO contributors from across the world is key to making alternative and sustainable communication resources available to the wider GEO community. Without such collaboration, GEO communities are beholden to using communication networks and services which are not optimised for their needs, demands or budgets. This session seeks to provide a platform for regional GEOSS contributors to explore and understand the latest developments from these new and existing GEO participating organisations. Especially those involved in developing the physical infrastructure and communication network services, required to make the regional GEOSS platforms a success. Building on the ever-expanding GEO Communicators Network, this roundtable is intended to bring together communications professionals from across the GEO community, to share knowledge and experience, identify opportunities for collaboration, and highlight best practices of communicating the impact of Earth observations. Following a short update on global GEO communications work, participants will be encouraged to share their own work and efforts supporting the GEO community with strategic communications, ask questions and discuss challenges and opportunities. A more detailed overview of the session will be available shorthly. discuss how to enhance international collaborations among earth observation platforms. (TBD) We will invite guests and let them introduce the outcomes of DIAS activities for international collaborations. The Paris Agreement represents a paradigm shift in climate negotiations, with a strong focus on tracking progress in a transparent way and ultimately feeding into the Global Stocktake. To achieve this, systematic and long-term earth observation data are a necessity. 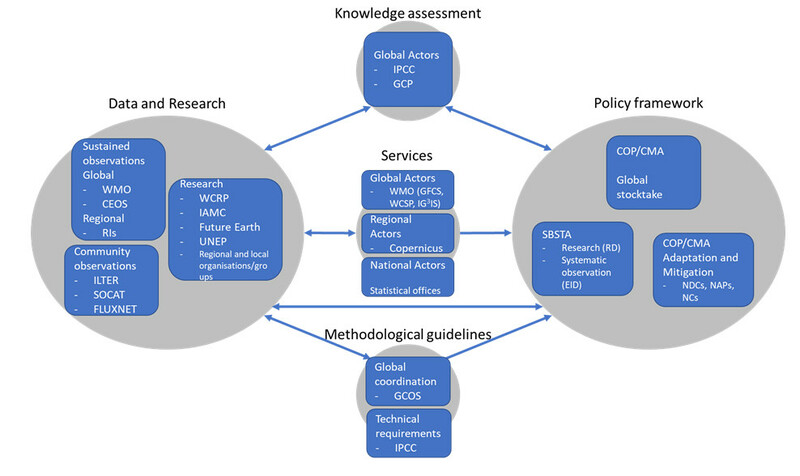 The GEO Carbon and GHG initiative bring together the efforts of the main actors from in situ, satellite, modeling and inventory communities to analyze and meet the needs of the policy-makers at all levels of the UNFCCC process. Together with the Global Carbon Project, GEO-C and its members work on improving carbon budgets, standardizing data streams, and contributing to reduce uncertainties of national inventories. This side-event is organized as a workshop and puts the needs for observational data at the center of the discussions. Using the analytical framework described in the graph below, the participants will explore some of the essential links between the actors in different groups. After the introductory part, the event will include three modules, each starting with short presentations given by experts who will set the scene for the work of the participants in small groups. The first module will examine the link between services and observational data: what kind of data is needed for the development of existing services or the creation of new ones? Module 2 will focus on the access to this data: how can different types and sources of data be made accessible and linked together? The last module will focus on the specific expectations set by the upcoming 2019 Refinement of the 2006 IPCC Guidelines for National GHG Inventories or the development of essential variables. This event will discuss demands and proposals for FY satellites services to support the disaster risk reduction in "The Belt and Road" countries. CMA will give a brief presentation on the data, products, services and the international emergency support mechanism of FY satellites. All the delegations from "The Belt and Road" countries as well as other countries interested in FY satellites application are welcome. We plan to work together to help national and local actors in all countries use Earth Observation (EO) to achieve Land Degradation Neutrality (LDN) as set out in the Sustainable Development Goals (SDG target 15.3). EO applications are at the cutting edge of LDN assessment, planning, implementation, monitoring and reporting. The GEO LDN Initiative is a unique stakeholder-driven initiative with a clear policy mandate from the United Nations Convention to Combat Desertification (UNCCD). The purpose of this policy dialogue is to bring various stakeholders together to discuss the current and future needs of the end-users and decision-makers in order to develop an effective and coordinated initiative from the Earth observations and geospatial community to assist countries and other actors involved in implementing LDN in setting policy, planning and investment priorities among large and diverse land resource areas. This side event will discuss the proposed Digital Earth Africa initaitive, which will build on the open-source Open Data Cube technology to establish a continental-scale platform that can track changes across Africa in support of support responses to critical issues, including soil and coastal erosion, increasing agricultural productivity, forest and desert development, water quality, and changes to human settlements. The event will bring together the project sponsors, GEO Members from Africa, and the broader GEO community to discuss how to take the initiative to the next step, and how to build on the recently launched Regional Africa Data Cube activity. This interactive workshop will discuss approaches for collaboration between the academic, public and private sectors to advance the application of earth observation in support of the SDGs. The workshop will have two parts. During the first half, speakers will present examples of collaborative projects in which an academic university team partners with a government or multilateral development organization to build new capacity for earth observation applications. The second half of the workshop will be a facilitated dialog that gathers insights from participants about their experiences in academic/public/private sector partnerships. The objective of the workshop is to document practices that have been shown to help transfer academic research approaches into practice within national governments, with private sector, local governments and others. The presentations will include examples from projects pursued by the Space Enabled Research Group at the Massachusetts Institute of Technology in collaboration with the United Nations Development Program and the government of Benin. Multi-lateral and Global Development Community - Earth observations and other space technology supporting development, humanitarian and social welfare. Mónica Miguel-Lago is the executive secretary and sector adviser for EARSC gained through 15 years of working experience in Earth Observation interacting with different stakeholders from most highly regarded technological related firms to organizations such as ESA, EU, GEO or UN Units. With a scientific background and proven ability and experience of conducting international programs, she is leading a methodology for assessing the maturity of (G) EO activities at national level under an H2020 project. Her experience in outreach projects, education and communication on the capabilities and limitations of Earth Observation makes a valuable asset for the project on sector skills strategy where she is leading and coordinating the preparatory work and road map. She is responsible for relations with EARSC members, understanding the services portfolio evolution and contributing with community relations, specially groups with focus on Sustainable Development Goals. Her engagement to consulting activities in the EO industry developed a strong belief that innovative EO can enable tremendous business growth and she is extremely pleased contributing on these exciting times for the sector. Chen Jun is the leading scientist of China’s global land cover mapping programï¼Âand developed the world’s first wall-to-wall 30-m global land cover data, GlobeLand30. He has published over 200 papers and supervised 50 Phd students. He served the International Society of Photogrammetry and Remote Sensing (ISPRS) for over twenty years, including Congress director, secretary general and president. In 2015, he received Geospatial World Innovation Award in 2015 and Asia Geospatial Lifetime Achievement Award in 2017. Chen Jun has just completed the first comprehensive assessment of progress towards SDGs in China at a county level. He is going to talk about the collaboration about this. Antje Hecheltjen studied geography in Tuebingen and Bonn (both Germany) with a focus on development research as well as on remote sensing. Lived in Australia, the Philippines and Ecuador, and worked with several countries in Africa and Latin America. Did research on multi-sensor LULCC and automated change labelling at the Center for Remote Sensing of the Land Surfaces (ZFL, Bonn). Worked as a consultant for the UNCCD. Worked as associate expert at the United Nations Programme on Space-based Information for Disaster Risk Reduction and Emergency Response (UN-SPIDER), a programme of UNOOSA. Working as advisor for the German development agency (GIZ) with a focuss on UNCCD-related issues, especially Land Degradation Neutrality (LDN). One of three Interim Co-Chairs of the GEO-LDN Initiative. Dr Graciela Metternicht Director of the Institute of Environmental Studies, Graciela Metternicht is the former Regional Coordinator of Early Warning and Assessment of the United Nations Environment Programme (UNEP) for Latin America and the Caribbean. Prior to joining the UNEP, Professor Metternicht was Head of Discipline and Professor of Geospatial Systems and Environmental Management at the School of Natural and Built Environments of the University of South Australia (UNISA). Prior to joining the UNISA, she was a Professor of Spatial Sciences at the Western Australian School of Mines (WASM), Curtin University of Technology. While at UNEP, Professor Metternicht was responsible for the planning and implementation of projects related to environmental assessment and early warning in Latin America and the Caribbean, including capacity building and the provision of technical assistance to governments of the region in policy uses of these outputs. She made significant contributions to global and regional environmental reports of the UNEP and the UN, such as the 5th Global Environment Outlook (GEO 5) - the most authoritative assessment of the state, trends and outlook of the global environment - and major reports focused on resource efficiency; sustainable, resource-efficient cities; and regional advances on environmental sustainability, indicators of sustainable development, and climate change. https://sdgs.org.au/ (to add case studies). Earth observation always is a joint effort between remote sensing measurements by satellites etc. and the fine grained observations by in-situ facilities. ENVRI is the cluster of Environmental Research Infrastructures in Europe which are long term funded to contribute to these vital in-situ measurements of Earth's Environment, stretching out from the deep ocean and solid earth into the highest parts of the atmosphere, measuring life on earth, the state of the atmosphere and oceans and the geophysycal processes that infuence our planet. In this session, ENVRI wants to demonstrate the relevance and importance of these in-situ data for sustainable development. To demonstrate the need to combine this in-situ data with remote sensing data and environmental modeling efforts, to achieve better science and more advanced and innovative services to the public, decision makers and companies. Dr. Werner Kutsch is Director General of ICOS since March 2014. He is biologist, plant ecologist and ecosystem scientist by education and has worked on ecosystem carbon cycling for 25 years in Europe and Africa. The focus of his work has been for a long time in the comparison of ecosystems after land use change and integrating complex landscapes. He has worked at the Ecosystem Research Centre of University of Kiel, at CSIR in Pretoria, at the Max-Planck-Institute for Biogeochemistry in Jena and at ThuÌÂnen, the Federal Research Institute for Rural Areas, Forestry and Fisheries in Braunschweig. ICOS is an ESFRI Landmark Research Infrastructure and a legal entity (ERIC) since November 2015. As Director General, Dr. Kutsch is the legal representative and overall coordinator of the Research Infrastructure and currently managing the final internal integration of ICOS. This work comprises internal organisation of the operations of the distributed observational networks and central facilities, on optimizing the internal data flow between the different observational programs of ICOS, on developing the data platform of ICOS (‘Carbon Portal’) which will also serve as an interface to COPERNICUS and GEOSS, and on deepening the cooperation with other RIs. Dr. Kutsch is experienced in data acquisition, post-processing, data analysis and modeling of ecosystem carbon budgets. Integrating ICOS-internal data streams and fostering usage of ICOS RI data for GHG modeling are some of his main goals for the next years. Furthermore, he is very interested in further developing data citation systems. He is responsible for the external representation of ICOS ERIC and currently leading the development of its future strategy. ICOS aims to be part of European and global integration initiatives that that support the usage of in-situ observations for improving the national inventories on greenhouse gases. Dr. Ari Asmi has extensive experience on atmospheric sciences, data science, research infrastructure development and collaboration, strategic planning and project management. He is currently Project Director of the ENVRIplus Cluster project, and the coordinator of RISCAPE international research infrastructure landscape project and WP leader in COOP H2020 infrastructure project on international RI collaboration. He is also involved several external projects and initiatives, such as a co-chair of several working groups of the Research Data Alliance, and a number of EU projects since FP5. He is the main author of the ENVRI Environmental Research Infrastructure Strategy document and one of the architects of the ENVRIfair follow up project to ENVRIplus. Dr. Jean-Noël Thépaut is the Head of the Copernicus Climate Change Service (C3S) and Deputy Director of Copernicus Services at the European Centre for Medium-Range Weather Forecasts (ECMWF). C3S is a core Copernicus Service operated by ECMWF on behalf of the European Union. C3S combines observations of the climate system with the latest science to develop authoritative, quality-assured information about the past, current and future states of the climate in Europe and worldwide. Prior to this role he was the Head Data Division and Deputy Director of the Research Department at European Centre for Medium-Range Weather Forecasts (ECMWF) where his section developed world-class data assimilation algorithms for Numerical Weather Prediction, the exploitation of satellite observations from operational and research Earth Observation platforms, and the development and production of state-of-the-art climate re-analyses. Jean-Noël Thépaut is “Ingénieur Général des Ponts, des Eaux et des Forêts” and graduated from the French National School of Meteorology. He received his PhD from PARIS-VI University in 1992 in the field of atmospheric data assimilation. He was also involved in the early development of the variational data assimilation systems at ECMWF and Météo-France. Jean-Noël has served on a number of Committees, including the EUMETSAT Mission Expert Team for Meteosat Third Generation and EPS Second Generation, the NASA Global Modeling and Assimilation Office Advisory Board and the ESA Earth’s Science Advisory Committee (ESAC). He is currently co-chair of the World Climate Research Programme Data Advisory Council. Dr Pekka Kolmonen works as a senior research scientist at the Finnish Meteorological Institute. He is an expert in inverse problems related to radiative transfer. His current work mainly consists of the development of algorithms for the retrieval of aerosol properties using satellite imagery, and the maintenance of resulting aerosol products. He has taken part in several ESA and EU projects exploiting satellite data for the determination of aerosol conditions. He is also involved in aerosol-cloud interaction research and the development of atmospheric correction methods. In the past he has worked with in situ measurements of aerosol properties. Robert (Bob) L. Crabtree PhD is a systems ecologist who has worked in the Greater Yellowstone Ecosystem for 30 years. He is founder and Chief Scientist at the Yellowstone Ecological Research Center (YERC)—a non-profit organization specializing in long-term collaborative research at large spatial (ecosystem) scales to increase the role of science at the decision-making table. He has pioneered a regional model to understand the cause and consequence of natural- and policy-experiments such as floods, wildfires, wolf restoration, land-use change, animal migration, drought, snowpack change, and invasive species spread. He has authored over 65 peer-reviewed scientific publications and has been principal investigator on over 80 grants (DOI, NASA, NSF, SBIRs, and DoD) that have led to another 100 publications on collaborative projects in Yellowstone and other benchmark ecosystems in North America. He continues to strive to 'translate' the results of ecological research into informed decision-making and on-the-ground conservation action. He has recently been involved with NEON and NASA in designing a regional model for Ecological Forecasting. Jacco Konijn MSc has over 10 years experience in managing and coordinating European Projects in the field of Biodiversity and Ecosystems Science. Jacco coordinated the LifeWatch (FP7) preparatory project, the CReATIVE-B (FP7) project, a policy coordination action with Biodiversity Research Infrastructures Worldwide, the ENVRI (FP7) cluster project and the GLOBIS-B project, developing workflow solutions for Essential Biodiversity Variables on a global scale, collaborating with sister RIs in biodiversity and ecosystems research across the globe. Jacco is member of the Executive Board and Work Package leader in the ENVRIplus project, and is involved in the establishment of LifeWatch, an e-Infrastructure, set up as a distributed Research Infrastructure to advance biodiversity and ecosystems research. This side event is intended to promote discussion related to recent GEOGLOWS progress on Water Prediction Capabilities and Essential Water Variables in the light of the needs of two priority policy areas: SDGs and the Sendai Framework. In addition to providing updates on GEOGLOWS progress on these topics, other groups including AWCI, CI, CEOS, Aquawatch, and IGWCO, would provide updates on their contributions. Time would be devoted to exploring the potential of new technologies such as AI and citizen science in addressing GEOGLOWS issues. This workshop will be organized in two parts; first will focus on the UNSD’s implementation of the SDG indicator framework followed by an exploration of available data and analytical tools to support SDG reporting and other critical missions. UN Statistics Division will share their high level vision for the SDG framework and system of systems and showcase the results of their collaborative research initiative, empowering countries to apply spatial data and analytics to support their SDG exploration and reporting. The framework has been adopted by over a dozen countries and was designed to be easily replicated. The framework enables countries to leverage geospatial data and earth observation data and apply spatial analytics to derive and share required reporting data. The second part of the session will dig into a series of ready to use tools and applications that have the flexibility to integrate various data sources and apply analytics (no coding required) to translate data into actionable information. These data exploratory and analytic tasks are no longer limited to specialized researchers, accessible web based tools are democratizing data access and analytics, empowering broader creation of new information products. To be impactful, this new information must also communicate effectively to stakeholder’s, we will demonstrate real examples of this through interactive maps, applications and story maps addressing the interests of technician’s, citizens and executive decision makers. At this side event attendees will learn how other countries can participate and quickly adopt this technology, proven scientific methods and applications to aid in SDG reporting. GEO has adopted the Sustainable Development Goals as a key priority. A range of GEO Flagships, Initiatives and Community Activities are now developing new techniques that can support countries to achieve and track progress towards the SDGs. This side event will discuss how the GEO community is leveraging, and could further leverage, the open-source Open Data Cube technology to provide an operational platform or 'home' for these techniques. We will showcase examples from around the world of how the Open Data Cube is being used today to both measure and drive progress against the SDGs. As an open-source project, the Open Data Cube provides a technology that can be tailored to meet local needs, as well as enabling users to contribute their enhancements back to the project to the benefit of others. The Open Data Cube provides a platform for GEO activities to get their work out to the world. This event will also demonstrate the Open Data Cube Sandpit - a new capability that allows anyone, anywhere to create their own demonstration Open Data Cube and trial a growing suite of SDG tools. 1730:1830 - Demonstration of a "do-it-yourself" Open Data Cube for SDG deployment. The Geo Vision for Energy (GEO-VENER) recognizes the critical importance of energy in working toward sustainable development and poverty eradication. SDG 7 explicitly seeks to ensure access to affordable, reliable, sustainable, and modern energy for all. In achieving SDG7, new linkages and technical innovations are needed that incorporate both renewable energy and the growing demand for mineral resources, including CRMs, induced by the development of renewable energies and the energy transition towards a decarbonated society. This session will explore current applications, user linkages, and uptake in energy management as well as seek ideas for new partnerships. The goal of the side event will be two-fold: 1) share updates and draw connections between mineral resources and renewable energy as the world strives to achieve SDG 7 and 2) explore how a revitalized GEO-VENER Community of Practice (CoP), particularly in the Asia Pacific region due to the meeting location, can help ensure continued progress and coordination. After a series of presentations, a discussion will be facilitated to learn more about applications and determine a path forward for an engaged GEO-VENER CoP. Natasha Sadoff and Stéphane Chevrel: concluding remarks. Here is a quick update on progress towards adopting the new GEO Land Degradation Neutrality (LDN) Initiative to support end-users and decision-makers for more rational land management and planning. 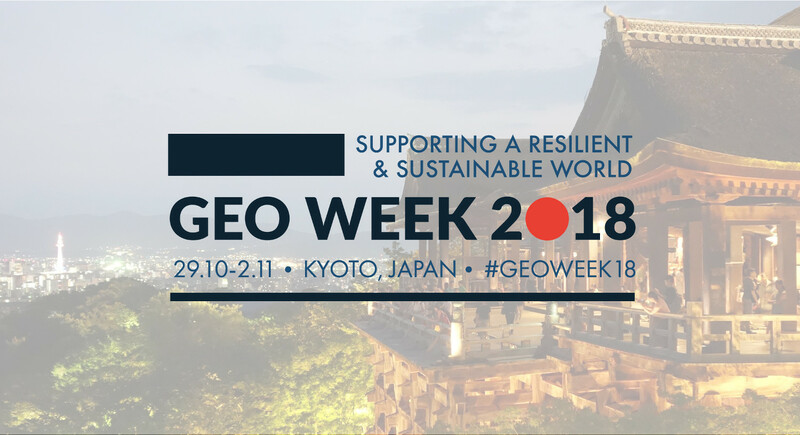 First the LDN Initiative is part of the update to the 2017-2019 GEO Work Programme and we would like to invite those that are interested to participate in its first Steering Committee meeting to be held on 02 November 2018 at 10 am in Room K located in the Kyoto International Conference Center. Second, the LDN Initiative will kick off three working groups that will require the diverse skills and expertise of the GEO community: (1) capacity building, (2) data quality standards, and (3) data analytics. Please attend the meeting on 02 November to learn more and consider participating. Last, through the GEO secretariat, the LDN Initiative is issuing a call for secondments to support the Steering Committee, working groups and their user-driven work plans. Those country members and POs that would like explore this exciting opportunity are encourage to contact the GEO Secretariat (secretariat@geosec.org). A brief summary of the LDN Initiative can be found on page 100 of the updated GEO Work Programme.